HAMPSHIRE captain Martin Young emerged from a record-breaking eighth English county finals with tears in his eyes. His team of veterans turned on the style as they finally claimed a second English County Championship. The 47-year-old who has played in more finals than anyone since it became a round-robin contest in 1982, donned sunglasses for the last couple of shots to hide his emotions from his opponent as he tried to salvage a half from his match against Lewis Pearce. After collecting the trophy at the spectacular Trevose Golf Club overlooking Cornwall’s North Atlantic coast, Young, who was the only-playing captain out of the four finalists, said: ‘This is so weird. I am so unbelievably happy. ‘I think having an experienced squad made a difference. ‘We did not have any current internationals like we have in the past. ‘We’d been there before and felt the pain of not winning – seven times in my case. ‘This was our third final in a row and this time we brought people who work as builders, roofers, accountants, recruitment consultants – and a golf club secretary. Young was proud of the way the team coped with difficult conditions. 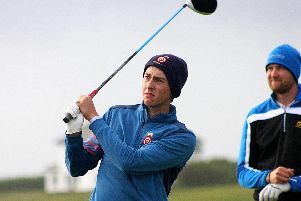 He added: ‘We played the course in brilliant sunshine on Thursday and got to know the place. ‘Then when the weather came in on Saturday and Sunday and threw everything at us, we didn’t moan. We just got on and played. The Hampshire squad included four players over the age of 35 with Hampshire’s last two British Amateur champions Harry Ellis and Scott Gregory unavailable to play. Rowlands Castle’s Tom Robson played his part with a 5&4 victory over Jake Walley in the penultimate game. And it was left to club-mate Billy McKenzie to hang on for a half in his ding-dong with England international Jack Gaunt, who was the loser in this year’s English Amateur Championship. McKenzie, who will spend at least one more year on the amateur circuit full-time, said: ‘I knew everyone behind me was well up, so it made it easier coming down the stretch. ‘But getting the winning half point was fantastic, especially against Jack who is a great player. For Robson the success was very sweet after four previous attempts.